Wheel Weigher Scale systems from Intercomp save money by buying a wheel load scale system as a complete package. System includes 2 platform scales. Charger is also included in the system. On top of all that, the carrying case is also a part of the Intercomp Wheel Load Scale System. 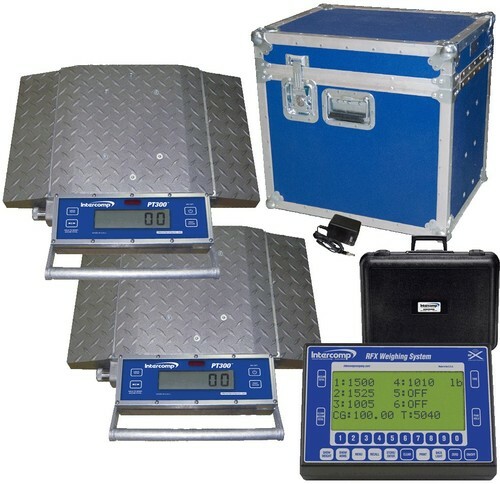 Lead time is usually around three weeks before shipment and the price includes freight for customers in the continental U.S.
Includes: Two scales (12" x 12" platform) with wireless output, scale charger and storage case for scale pads. 12" wide platform accommodates single tire (outside tire in dual wheel configuration).Total Capacity: 20,000 x 5 lbs.